Answered ranged from HiWay Haulers to Tommy Tanker and from Original Molds to the re-release of M.U.S.C.L.E. figures – and all of the guesses would make fantastic finds. The discovery is indeed a new Alpha Non-Poster figure. However, the aspect that makes it huge, monstrous, game-changing, and paradigm-shifting is its color: Salmon. The appearance of this figure causes serious problems with many of the theories, highlighted in Philosophy 200, regarding Alpha and Beta figures. But could these problems actually explain the Alpha and Beta Non-Poster figures? I was a childhood MUSCLE MANIAC and am only now revisiting my extensive collection. Is the salmon-colored kneeling Geronimo considered an ultra rare, or is ONLY the red version? 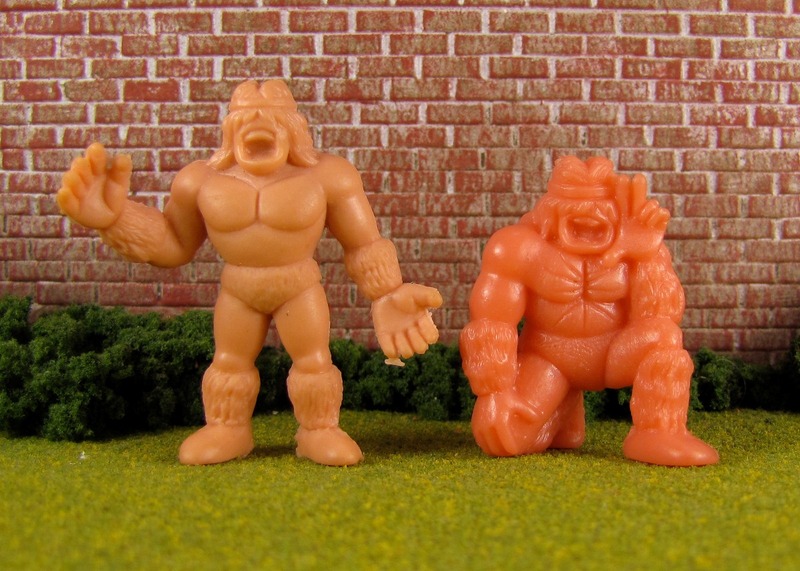 Normally these types of comments and emailed questions are simple and honest mistakes – collectors have keshi or custom figures and mistake them for authentic M.U.S.C.L.E. figures. This collector, named David, was certain the figure was the same texture, color, and rigidity as a normal M.U.S.C.L.E. figure. David tried to provide a picture of the figure, but struggled to get a good picture. Again, this is normally a sign that the figure is not authentic. 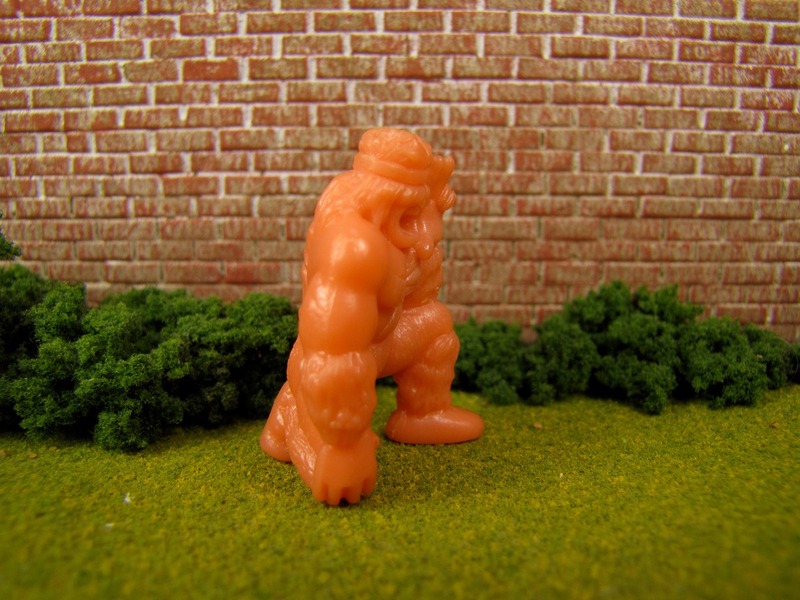 The University of M.U.S.C.L.E then offered to inspect the figure. If it was authentic then the figure could be purchased or, at least, the figure could be properly documented. If it was unauthentic, then the figure would be returned. David agreed and the figure was mailed. 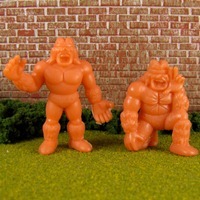 When the figure arrived upon opening the package it was immediately obvious that the SGS was an authentic M.U.S.C.L.E. figure. As can be seen by the pictures below. When a picture of a Salmon M.U.S.C.L.E. figure is viewed by itself some it can sometimes be difficult to be 100% sure it is a Salmon figure and not a dirty or discolored Flesh or even Orange figure. These comparison pictures eliminated any of that potential confusion. 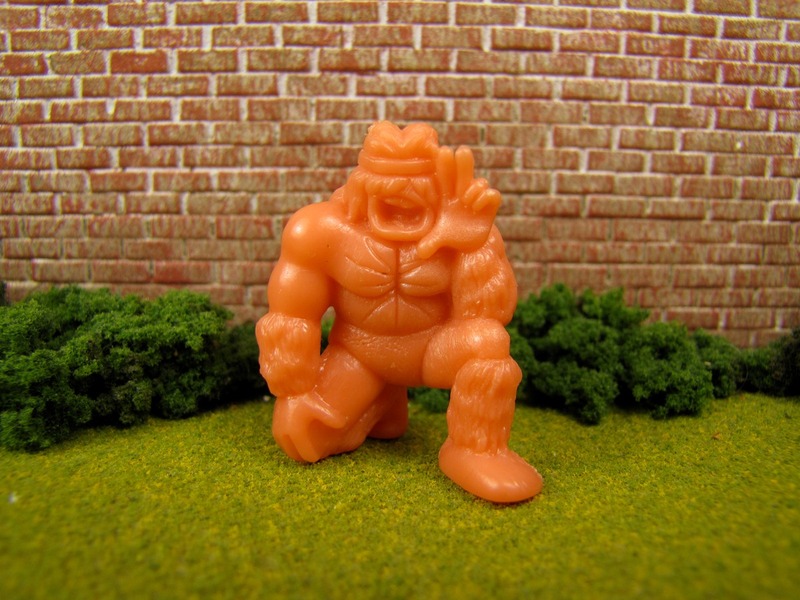 The final concern is always, “What if it is a custom figure?” Of course the texture and rigidity of M.U.S.C.L.E. plastic is instantly recognizable, but the colors are very distinctive too. 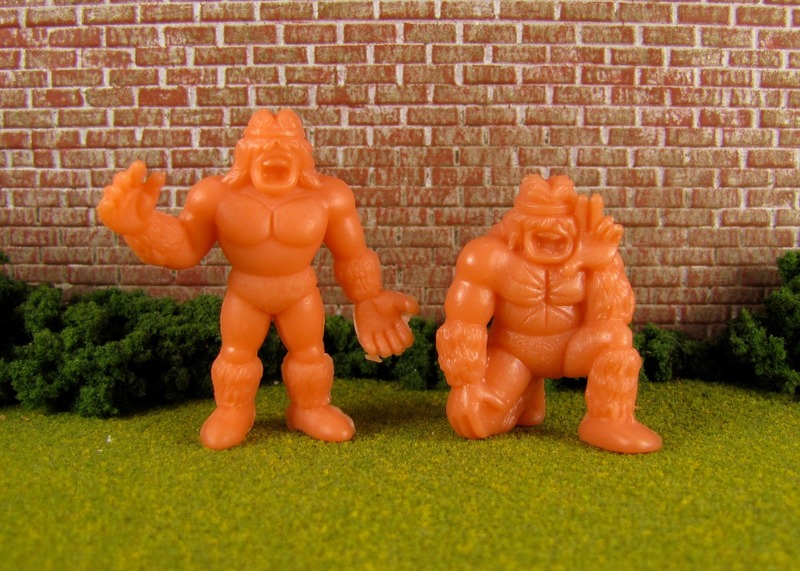 Below the SGS is compared to keshi, custom, and authentic M.U.S.C.L.E. figures. Even with all of the pictures collectors often want more information. David was more than generous in providing as much provenance for this figure as possible. David funded his collecting by doing his chores. 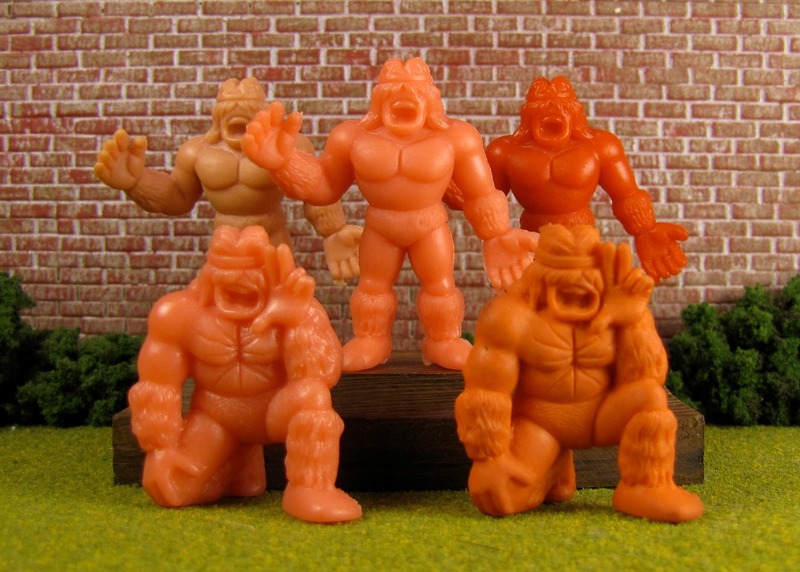 And then would purchase the figures at stores like Children’s Palace, Toys R Us, and KB Toys – which is the store he remembers getting his last pack of M.U.S.C.L.E. figures from in the very early 1990’s. 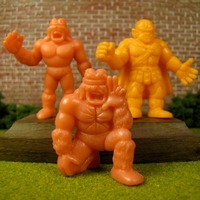 As M.U.S.C.L.E. started to disappear he tried to fill the void with Monster In My Pocket, but it never felt the same. David remembered buying lots of 10-packs at the beginning of his collecting, but as the line died out it was mainly 4-packs. However, thanks to mainly 4-packs being available he was able to more easily purchase figures he needed and avoid doubles. David grew up in Falls Church, VA and did a little bit of M.U.S.C.L.E. 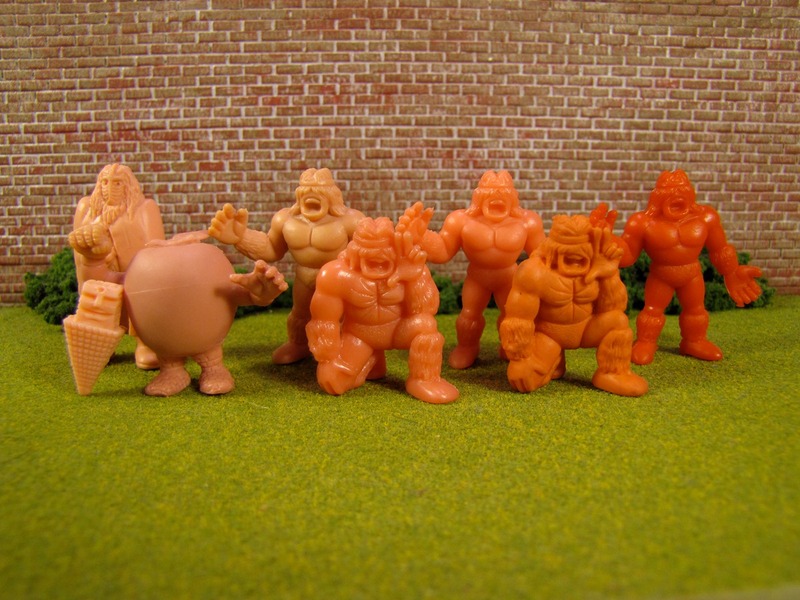 figure trading with his friends, but no one else was as into M.U.S.C.L.E. figures as he was. He felt 100% confident the figure came from one of his many purchases and not from a trade. What does the discovery of the SGS mean for the Alpha and Beta Non-Poster figures? It could mean many things. Most importantly it means that collectors need to start talking about the implications of discovering this figure. 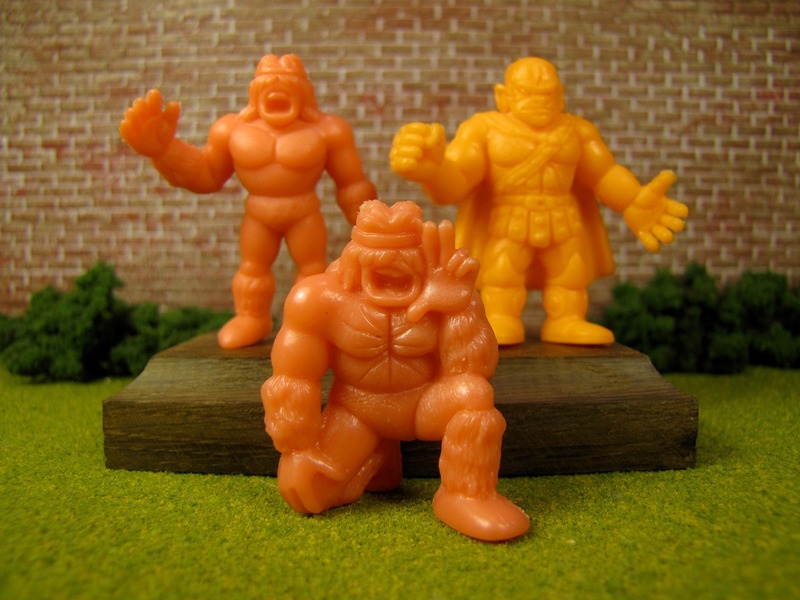 The best breakthroughs have always come through synergistic problem solving among M.U.S.C.L.E. collectors. 1. The SGS figure comes from Part 13 of the Kinnikuman parts. There are quite a few Class A and Class B figures from this part. Could Part 13 have been damaged and retooled more than once? Resulting in the Red and Salmon Geronimo figure? 2. Could all of the Alpha and Beta figures simply be error figures? When the Alpha and Beta were all Flesh there seemed to be a logical error. The introduction of Red and Blue figures shifted the thoughts, but a Salmon figure should never have shown up. 3. There are more Non-Poster figures of the final wave of colors out, undiscovered in the world. 4. Could the SGS be the first of a new wave that was planned – right before cancelation? Those four ideas only scratch the surface regarding what the appearance of a Salmon Non-Poster figure means. Please post any thoughts, theories, or impressions in the Comments below to start the discussion. Not only are there implications to consider regarding this figure – there is opportunity. The University of M.U.S.C.L.E. told David that being able to authenticate this figure would erase any potential skepticism regarding the authenticity of this figure and make it much easier to sell. The University of M.U.S.C.L.E. also offered to sell the figure for him and share zero percent of any earnings. This is a stunning discovery, being able to authenticate and document this figure was more than the University of M.U.S.C.L.E. could have ever asked for. David’s SGS will be sold by the University of M.U.S.C.L.E. and will be appearing on eBay later this week. This entry was posted on Monday, October 8th, 2012 and is filed under History, Philosophy, Research, Uncategorized, UofM News. You can follow any responses to this entry through RSS 2.0. You can skip to the end and leave a response. Pinging is currently not allowed. Pretty neat. David and I sound pretty similar. 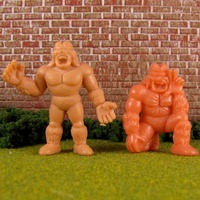 I loved MUSCLE, never got into MIMP… not sure why, I think it had a lot to do with the plastic types. Children’s Palace was where almost all my MUSCLE figures came from. Wow, that is an awesome discovery! One thing to keep in mind whilst speculating, both the red and salmon Geronimo figures were discovered in the US while the blue SR’s (and Magnificent 11) were discovered in Japan. Also of note, the Geronimo’s are lower part figures while most of the Mag11 were from parts later than 21. Part 21 was the production part they were on when M.U.S.C.L.E. was released. This really is the biggest news of 2012. Too cool! Whats the hold up? Post the auction already! Be sure to check-out Auction Watch #115 tomorrow! 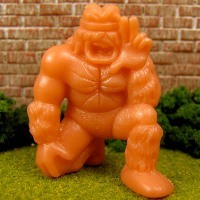 Auction Watch #115 - Interesting M.U.S.C.L.E. Auctions | University of M.U.S.C.L.E. 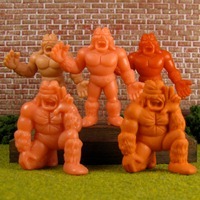 Auction Watch #117 - Interesting M.U.S.C.L.E. Auctions | University of M.U.S.C.L.E.